Is billing your customers more than once, just to get them to pay, what they already owe you, exhausting? 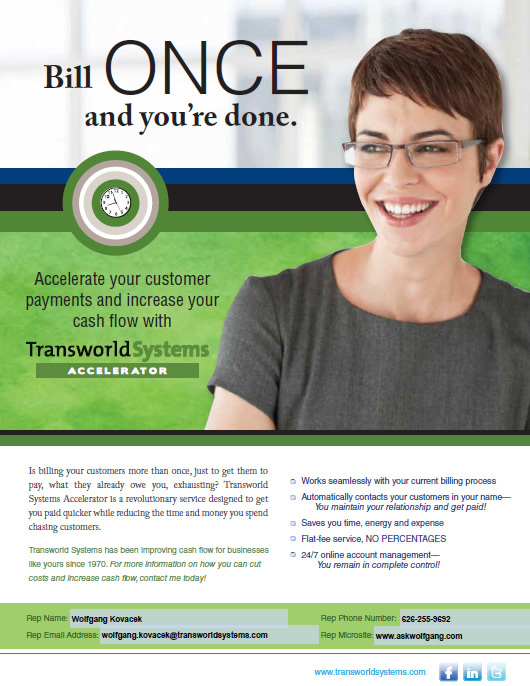 Transworld Systems Accelerator is a revolutionary service designed to get you paid quicker while reducing the time and money you spend chasing customers. A new updated flyer with beautiful graphics has been released by Transworld Systems and I am sharing it with you here in this blog post. send it to a friend who might be in need, because they are feeling the AR crunch.